Prestwich from country parish to suburban town. Part 1. Prestwich from country parish to suburban town. The latest book from the late Ian Pringle. 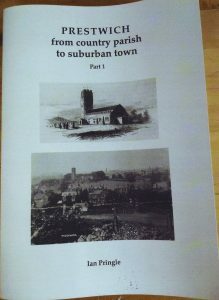 A brief historical account of the town followed by detailed analysis of the development of Prestwich and its historic buildings. An important contribution to the story of Prestwich by a knowledgeable expert.